This lab gives students the opportunity to investigate crystallization processes and textures. Students experiment with a crystalline wax, studying how/where the crystals form, how to get crystal-free material, and how different cooling rates affect crystal size and distribution. Students can even create their own pillow lavas and flow/cooling textures. The experiments also provide an opportunity to clarify the idea of quenching for students. 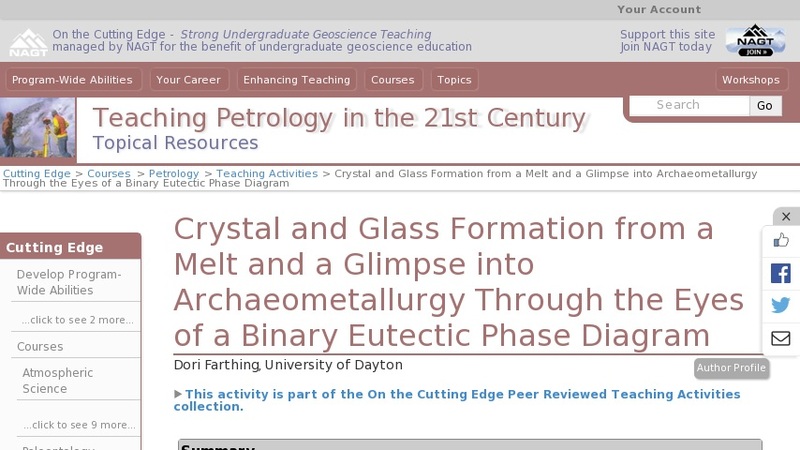 Once students understand quenching, they have an easier time completing the included exercise which involves looking a binary eutectic phase diagram and the modal abundances of glass and crystals in a real sample. The phase diagram and modal information are used to determine a melting/quenching history and composition for a historical sample of metallurgical slag.